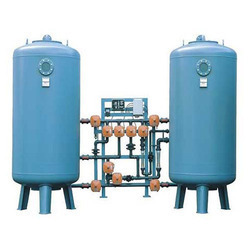 Providing you the best range of water softening plant with effective & timely delivery. Hard water interferes with all types of Water Softening Plant. Cleaning problems arise when the cleaning agents do not fully remove dirt and grime. Over time, clothes washed in hard water may look dingy and feel harsh and scratchy. White clothing continually washed in hard water will gradually show a grayish tinge. Dishes and glassware washed in dishwashers using hard water may be spotted when dry. Hard water causes films on glass shower doors, walls, and bathtubs. Hair washed in hard water may feel sticky and look dull. Regular soaps combine with dissolved calcium and magnesium to form soap curds or soap scum.